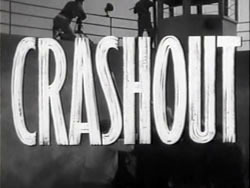 “Crashout” is like going to a film noir reunion. A late entry in the dark world of noir, the film gathers the likes of William Bendix (Out of the Past, The Blue Dahlia), Arthur Kennedy, (Too Late for Tears, Boomerang! ), William Talman (Armored Car Robbery, The Hitch-hiker), Luther Adler (D.O.A., Kiss Tomorrow Goodbye), and Marshall Thompson (Dial 1119, Mystery Street). Toss in Sam Fuller regular Gene Evans (The Steel Helmet, Park Row) and Beverly Michaels (Pickup, Wicked Woman) and you have a smorgasbord of dark city regulars. The film opens with a violent large scale prison break focusing on six escapees whose faces, if not their names are recognizable to any crime film devotee. For Bendix, it was a break from playing Chester A. Riley in the long running TV series, “Life of Riley,” and for William Talman, well he would be become the unluckiest lawyer on the TV screen, having to face Perry Mason every darn week. Director Lewis R. Foster keeps the film moving at a fast pace during its short 89 minute running time as we watch the escaped cons travel across the country by car and train to not only flee the clutches of the law but to recoup some buried stolen money. As the film moves along, greed, and a lack of trust creates an atmosphere of doom with each of the characters methodically done away with. Bendix gets to portray another of his not too bright thugs, without a sign of salvation in sight, but it is Arthur Kennedy’s character for whom the audience will feel the most emotional tug. He finds redemption way too late with an overdue appearance by Beverly Michaels as a farm girl the gang comes across. 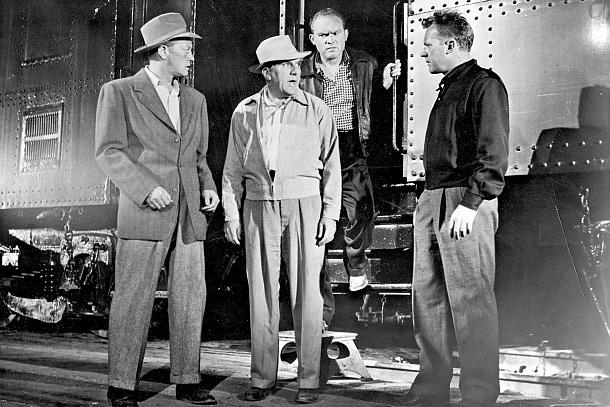 While the tough and nasty Bendix character along with Arthur Kennedy are the film’s acting highlights other cast members do well including Marshall Thompson, an actor who never made the big time (1), and Gloria Talbott (Daughter of Dr. Jekyll, I Married a Monster From Outer Space) in a small role. There is a nice sequence between these two when they meet while traveling by train. William Talman, Gene Evans and Luther Alder all add to the film’s dark pleasure. For director Foster, the film was a change of pace. He spent the early part of his career making a slew of shorts with Laurel and Hardy and almost forgotten comic stars like Louise Fanzenda and Karl Dane. By the 1940’s Foster switched to mostly undistinguished feature films before the final phase of his career brought him to television with shows like “The Adventures of Jim Bowie” and “Tales of Wells Fargo” among his many credits. Foster also wrote and/or had a hand in some impressive films including “Mr. Smith Goes to Washington” (story), “The More the Merrier” (screenplay), “The Farmer’s Daughter” (screenplay) as well as co-writer of “Crashout” along with producer Hal Chester and an uncredited Cy Endfield (Zulu and Sands of the Kalahari) who was blacklisted at the time. The film’s dark feel though can be attributed to the superb cinematographer Russell Metty whose noirish works include “The Stranger,” “Kiss the Blood Off My Hands” and “Ride the Pink Horse.” Metty also worked with Stanley Kubrick on Spartacus. 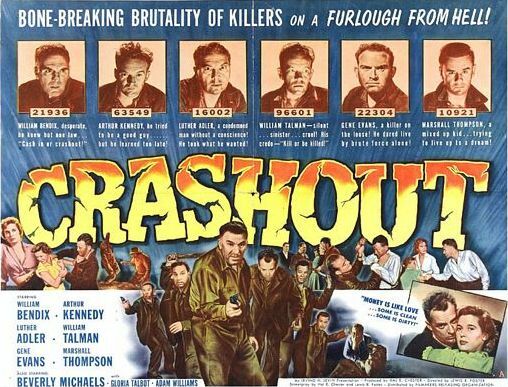 “Crashout” is good and welcome entry in the sub-genre prison film category, surprisingly violent and dark for its time. (1) Marshall Thompson is best known for the three years he spent as Dr. Marsh Tracy on the 60’s TV show Daktari. This entry was posted in 1950's, Film Noir, Film Reviews and tagged Arthur Kennedy, Beverly Michaels, Crashouts, Gene Evans, Gloria Talbot, Lewis R. Foster, Luther Alder, Marshall Thompson, William Bendix, William Talman. I always liked Marshall Thompson, and was a regular viewer of Daktari as a kid. He’s also remembered for appearances in three notable science fiction films: Fiend Without a Face (1958), It! The Terror From Beyond Space (1958), and First Man Into Space (1959). He possessed a likeable, low-key masculinity that made him a realistic, appealing authority figure. Though he didn’t become a star, he’s well-remembered. Hey Peter, Yeah, I also remember him from THE TALL TARGET as the brother of Paula Raymond and from a small budget film in the early 60’s called A YANK IN VIETNAM which he also directed. Haven’t seen FIEND WITHOUT A FACE. Will have to catch it. Thanks!!! Fiend Without a Face is worth staying with for its unforgettable climactic scenes, which are nightmarish and memorably disgusting, too. Thanks! Will definitely check it out! “…the film’s dark pleasure.” I’m sold! Marshall Thompson kept that baby face for a long time. “Battleground” and “The Valley of Decision” are a couple of my favourite early roles for the actor. BATTEGROUND is a film I have been wanting to see but never do for some reason, and as I mentioned to Peter, up above, I also need to catch FIEND WITHOUT A FACE . Well, this is another one I haven’t seen, John – and the presence of Bendix and Talman is a big lure for me (all that’s missing is Steve Brody). I’ll be checking out Crahsout – and thanks for the recommendation. This film has a great noir cast. It took me a bit of time to get use to Bendix in a serious role since I grew up watching him in THE LIFE OF RILEY and always thought of him as a comic actor unaware, at the time, that he had this wonderful career as a thug in so many great crime films. Hope you get to see this! John, I’ve been accustomed to William Bendix’s bad-guy characters in films like THE GLASS KEY, THE DARK CORNER, and THE BLUE DAHLIA, but wow, the rest of the cast weren’t exactly weak sisters either, including William Talman! Ir must have been a swell change of pace for his character, being on the wrong side of the law!. By the way, I like THE TALL TARGET, too! Terrific review, my friend!! Thanks Dorian! THE TALL TARGET is an enjoyable film that I have watched a few days. If you want to see Talman on the wrong side of the law you have to catch ARMORED CAR ROBBERY!. Great low budget crime film. Sorry for the late reply here. The weekend slipped by. Hope you had a good one. The cast is interesting and Kennedy always give a fine performance no matter what. I especially like him in the films, THE LUSTY MEN, BEND OF THE RIVER and BOOMERRANG!” Thanks as always! A noir reunion indeed John, and a convention of some fine talents. You have again breathed life into a film that may have escaped the radar for many.